Trainer Edward Harty enjoyed his first success at The Festival when Captain Cee Bee won the Spinal Research Supreme Novices’ Hurdle in 2008. This year, the same horse is back for more and currently heads the ante-post market for The Irish Independent Arkle Trophy. Having missed the entire 2008/09 season, the nine-year-old made a winning return to action in a beginners’ chase at Naas on December 3 and was then well in contention when falling at the last in a Grade One contest at Leopardstown on Boxing Day. His Cheltenham preparation was completed with a comfortable success back at Naas on February 6. Reflecting on his 2008 success, Harty commented: “We didn’t plan to give Captain Cee Bee such a long break before Cheltenham in 2008 but the weather conspired against us. It was bottomless ground for the Royal Bond Novices’ Hurdle at Fairyhouse and we didn’t want to risk him, so we gave him a little break that December. “He was supposed to run at Punchestown in early February but there was a mini-blizzard during the first race, and the field were finishing like drunken sailors, so we pulled the plug on that run as well. “We knew he was going to be a fair horse from day one and, as time went on, he started to look the real deal, even before his first run. My father had named him after my grandfather, which was a brave call because usually these things go pear-shaped and come back to haunt you. “The real making of him was actually when he had three runs on the Flat in 2007 - Kevin Manning rode him a couple of times. The horse really learnt from having a top-flight professional Flat jockey on him and going over a shorter trip on decent ground. He won at Killarney by nine lengths and J P (McManus, owner, who subsequently purchased Captain Cee Bee) happened to be watching the race and he was very impressed with the speed he showed. 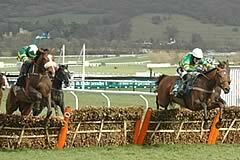 “He won his first start over hurdles for his new owner at Punchestown in October, 2007, and beat a decent field. I already had the Supreme Novices’ Hurdle at the back of my mind at that point and he got into the public eye on his next start when he took on some good horses in a winner of one race and annihilated them. “In fairness, it was a good training performance to get him to win at The Festival on the back of a four-month lay-off, but you need a good horse to do it. Sometimes, you are possibly better off going to Cheltenham one gallop too short as opposed to one gallop too many. “A P was all set to ride him but I was told at 9.55am on the Monday that he was going to be riding Binocular instead, so there was a bit of a panic until I found out that Robert Thornton was available. I had no hesitation in getting him to ride Captain Cee Bee because he rides Cheltenham so well and I knew that the horse wasn’t going to lack from the saddle if he was on board. “The pressure came off a little bit after the declarations because the media decided to latch on to other horses. I was talking to Robert before the race and I told that the one thing that would beat us would be stamina, so he should get to the front no sooner than the last and if the horse is good enough, he is good enough. Harty, 48, comes from a background steeped in racing history. His father Eddie rode the 1969 Grand National winner Highland Wedding, while his brother Eoin is a successful trainer in the US and handled the 2009 Dubai World Cup victor Well Armed. However, the following ecstasy turned to agony less than a month later as Captain Cee Bee was pulled up at Aintree after suffering from a broken blood vessel and he did not return to the racecourse for almost 20 months. Harty said: “Aintree was totally the flip-side - I went from my best day’s racing to my worst in the space of three weeks. I’ll take the plaudits for winning at Cheltenham, but I also have to take the blame for taking him to Liverpool. He had a long lay-off prior to The Festival and, in hindsight, it was bridge too far to bring him back so quickly. “The bleeding problem he experienced there has never raised its head before and after, so it could have just been one of those things. I spoke to John Oxx and he told me about good horses that have bled once and never done it again, so I am hopeful that it won’t return. “Having won the Supreme Novices’ Hurdle, there is always the temptation to return for the Smurfit Kappa Champion Hurdle the following season. But we always thought of Captain Cee Bee as more of a chaser and Binocular was the ideal candidate to carry the hurdling flag for J P McManus. “We didn’t want to delay his career over fences but he got a leg days before he was due to run and ended up missing the whole of the 2008/09 campaign. My wife Marie, who is also my vet, picked it up very quicky and between her quick diagnosis and the care he received from J P McManus’ camp, meant that he came back at the end of last year raring to go. “I actually think that he has improved for the rest. All horses have to mature at some stage, when they go all gangly and need time to strengthen up again. If you can persist with them, then they can come back and reproduce their previous level of form. “He has won twice now on very heavy ground and he can handle it now because he is a stronger horse. Conditions on his latest start at Naas were far from ideal but, whereas two years it wouldn’t have been fair to run him, this time it wouldn’t have been fair not to run him because he enjoys racing so much. “He is where we want him to be now - he needs a couple of bits of work but nothing too strenuous. He doesn’t have to prove to me how fit he is and he doesn’t have to burn up the gallops to prove it. I just want to keep him ticking over, let him strengthen up, and bring him over in good form. “The last time we went he hadn’t run for four months so we were trying to get the horse to a peak for Cheltenham, whereas now the work is all done and I am just keen to get him there. It’s a totally different set of circumstances, but it doesn’t necessarily make it any easier.